is the very first Afghani restaurant in Canada, serving gourmet Afghan cuisine to Vancouver and the surrounding Lower Mainland for over 41 years! Welcome to The Afghan Horsemen Restaurant! We are pleased to bring you the finest authentic Afghan cuisine in British Columbia, Canada. Winner Eight Years in a row for Best Middle Eastern Restaurant from the Georgia Straight’s Readers Choice Golden Plates Award 2008 – 2015, 2008 winner for The Vancouver Courier’s Stars of Vancouver Award, and the host location for the exclusive CKNW Christy Clark Show Town Hall Meeting on Afghanistan, The Afghan Horsemen Restaurant is known for its delectable cuisine, intriguing ambience, and best customer service. 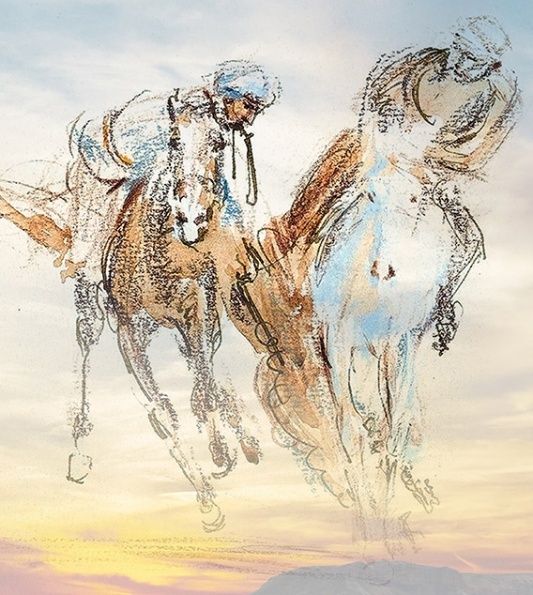 Established in 1974, the Afghan Horsemen was the very first Afghani restaurant in Canada. For over 36 years, our family-managed kitchen has been serving the Lower Mainland with gourmet dishes made from the freshest of ingredients. Let our friendly wait staff bring the wonder and beauty of Afghanistan to your table, and make your next dining experience spectacular! 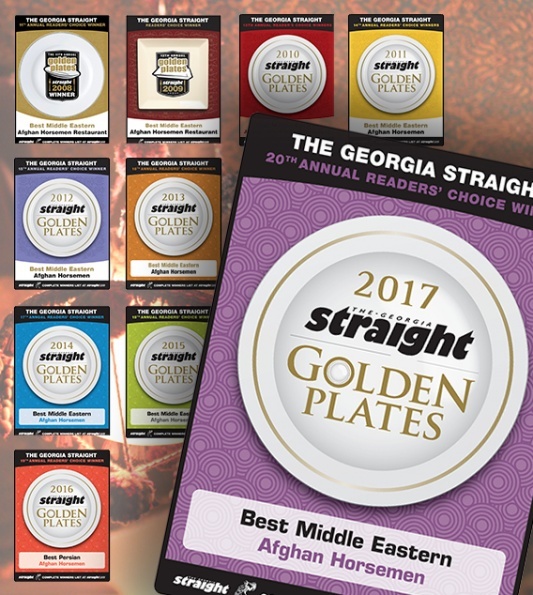 for the Georgia Straight's Readers Choice Golden Plates Award 2008 - 2015! Afghanistan has a rich cultural heritage spanning more than 5,000 years. The country lies across the ancient trade and invasion routes from Central Asia into India. Its position along these routes has been the greatest influence in Afghanistan’s history because invaders often settled there. It came to be known as the land of the Khyber Pass. Afghanistan is a landlocked country sharing borders with Turkmenistan, Uzbekistan and Tajikistan to the north, China to the northeast, Pakistan to the east and south, and Iran to the west. The official languages are Dari Farsi and Pashtu. Outside Kabul and a few other large cities, Afghanistan is still very much a tribal society. Religion and traditional customs have a strong influence within the culture. Afghani cuisine is mainly influenced by that of old Persia, India, Greece, and Mongolia. It draws together spices from India and Greece, styles of cooking meat from Persia, and rice, noodles and various pastas from Mongolia. The ingredients are fresh and without preservatives. The flavors of Afghanistan include cardamom, turmeric, cinnamon, cumin, saffron, cloves, coriander, garlic, black pepper, cilantro, dill and mint. Onion and tomatoe are also important in Afghani cooking. Afghan cuisine is noted for its succulent kebabs in addition to its variety of lentil and vegetarian dishes. Our authentic dishes provide an option for everyone.